The “unexpected behavior” of a massive black hole in ourMIlky Way Galaxy, has got astronomers excited: After staying inactive for more than a quarter of a century, it has unexpectedly awakened and started aggressively consuming material from its stellar companion. 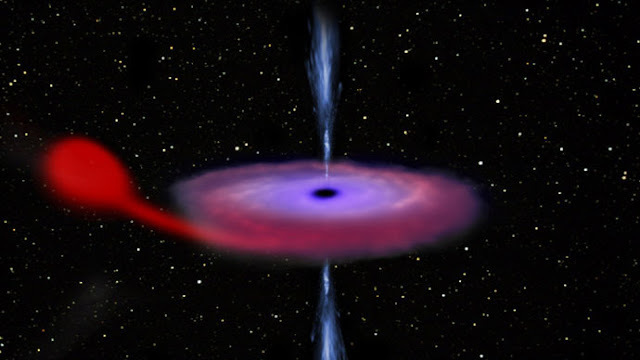 The V404 Cygni system, comprising of a black hole and a companion star, is located some 8,000 light years away in the Cygnus constellation of the Milky Way. The black hole’s unexpected wakening and apparent cravings were first spotted on June 15 by the Burst Alert Telescope of NASA's 11-year-old Swift satellite. Swift’s X-ray optics automatically spotted the gamma ray burst from the black hole. An X-ray burst also caught the attention of MAXI (Monitor of All-sky X-ray Image), device on the Kibo Japanese Experiment Module of the International Space Station. The double exposure of the action generated an exciting observation operation, with ESA’s 13-year-old Integral gamma ray observatory joining in the effort on June 17, to see and record the back hole’s movement at numerous wavelengths. Over the past weeks stargazers have detected an “exceptional outburst of high-energy light” as the black hole has nonstop consuming the material of its companion star, the European Space Agency (ESA) said in an announcement about the occurrence. Erik Kuulkers, integral project scientist at ESA, said “The behaviour of this source is extraordinary at the moment, with repeated bright flashes of light on time scales shorter than an hour, something rarely seen in other black hole systems,” The ESA describes that in the so-called “binary system”, the matter from the satellite star is dragged towards the black hole where it gathers in a disc before being heated up generating ultraviolet and X-ray wavelengths. It is then spirals and vanishes into the giant black hole.